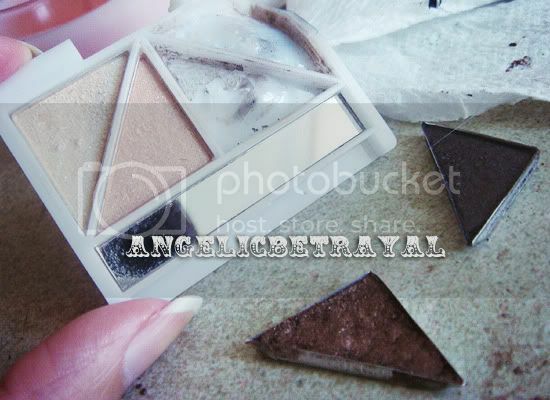 Many makeup addicts turn to depotting to streamline their collections and organize better. After seeing so many people depot their products, I was curious to try this activity out for myself. The following post is by no means a tutorial, rather I'd like to think of it as a walk-through of my experience. This was the mess I made while I was attempting to take apart a Lancome GWP quad and two eyeshadows from my E.L.F Butternut quad. I wasn't depotting much so I only used a few toothpicks as my tools and my freebie candle from Bath and Body Works to do the melting. I was getting very tired of seeing my Butternut quad lying around with two shades I liked a lot and two which I did not care for at all. 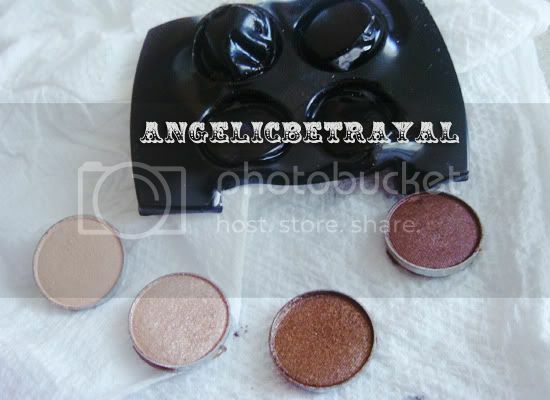 I depotted the darker shades which I use very often and left the lighter, useless shades in the palette destined for the dumpster. It took a bit of time for the flame to melt the plastic on the E.L.F quad but it was relatively easy. It is much easier to depot something with a lid because you won't feel the heat. I put all my newly depotted shadows back into the small Lancome compact so I now have a nice set of neutral shades together in one place. The Lancome shadows had some tacky glue on them which allowed them to stick onto the compact and I glued down the E.L.F shades using nail polish. Nail polish is pretty much my make-shift super glue whenever I need it. I would say my first depotting attempt was a success and I'll be sure to do it again soon :D I also went through my eyeshadows and weeded out some that I absolutely had no use for. I rarely throw out makeup (that is not expired) but I have some completely horrid products that only take up room in my collection. It also upsets me when I have products that I despise because I know I wasted money on the product. Luckily, I usually like what I purchase. I decided to toss a The Face Shop single in a light blue shade. This and another The Face Shop single were my first eyeshadows ever. 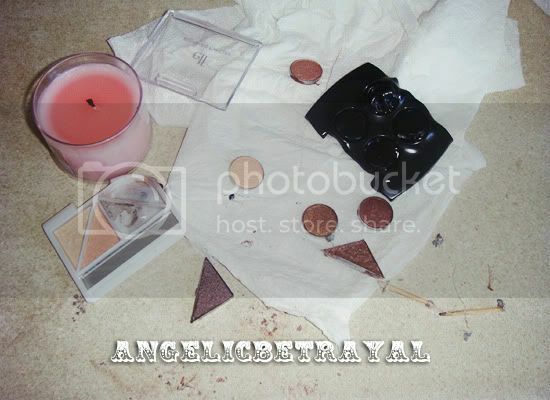 Unfortunately, there is barely any pigment and the shadows appear chalky on the skin. I'm debating over whether I should toss the other shade too, a pale baby pink, since I never reach for it.... 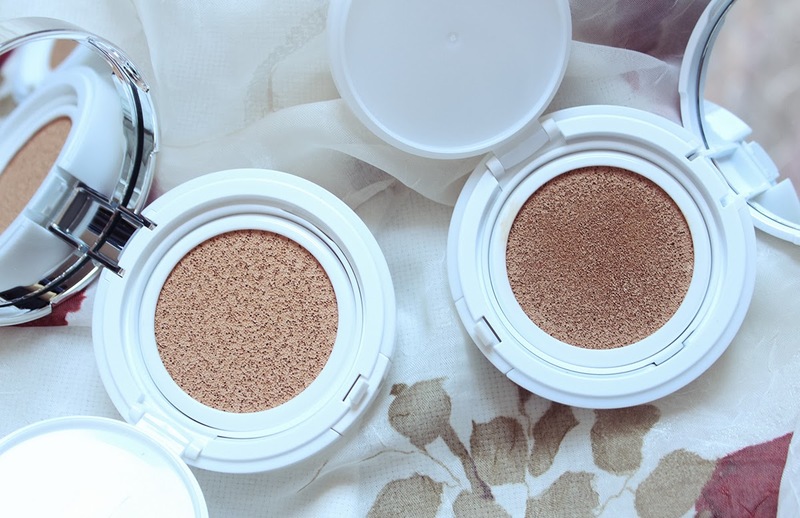 I also threw out E.L.F's quad in Nouveau Neutrals which I reviewed HERE. 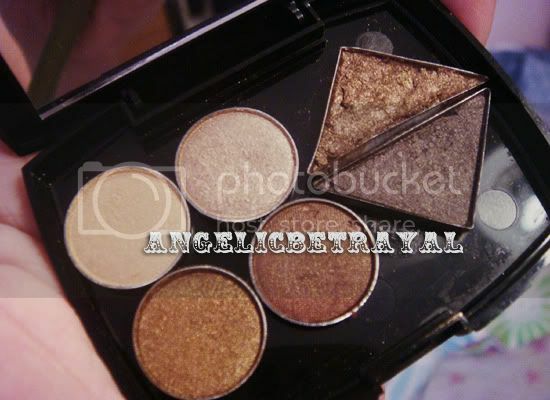 I dislike all of the colors in the palette and the pigmentation and texture is sub-par on every shadow. I had no use for it in my collection so into the trash it went. I don't depot my makeup and I don't think I would. I just like stuff being in its original packaging. If my collection is getting really hard to place in one area, I would prob throw out the ones that I have no need for. Jenny: I was kind of scared of depotting too but I try not to use knives or any potentially dangerous materials :/ When you use heat to melt the plastic and glue, you don't need a lot of force to pry out the pans. 鬼: I tend to prefer original packaging as well but the E.L.F packaging wasn't too fancy and I HATED the lighter two colors and it really annoyed me that I had no use for them. Serinny: Yup, same here. 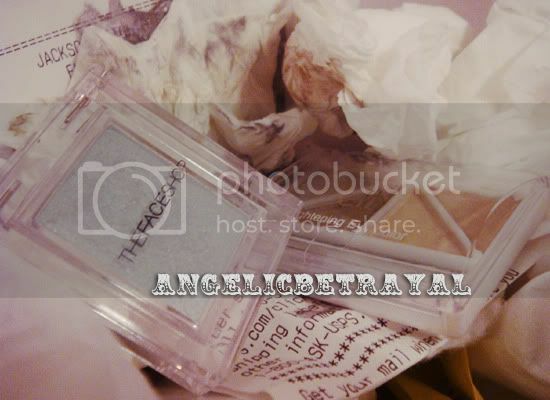 I hate throwing away makeup but if it's really bad, there's no point in hoarding it. 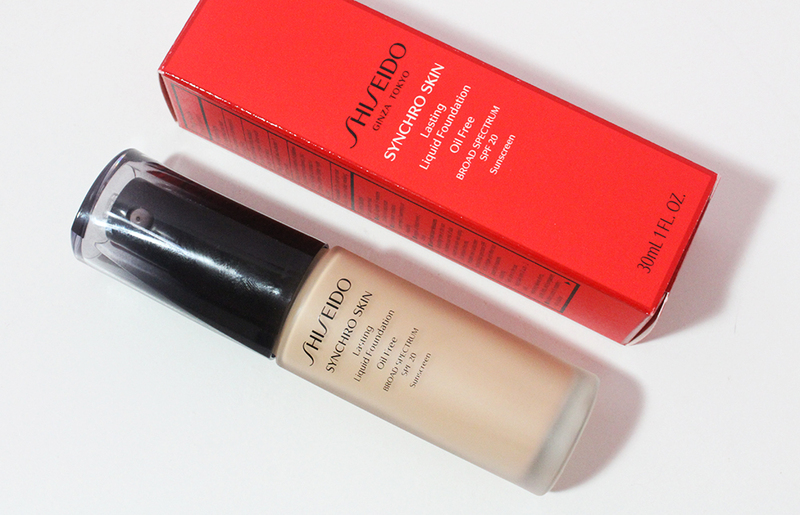 mandy: I really like original packaging but again, it was more that the lighter colors were annoying to look at. christine: Haha, that's a great idea :) If I ever need to do a large depotting project I'll enlist my boyfriend's help too ^^ I'm actually kind of scared of fire to be honest >.> But I don't mind a small candle haha.